Sorry for my absence lately everyone. I honestly haven't been the right mood to do a post. I have been so busy with work, and trying to rest and have some fun on the weekends - that I just haven't felt like getting my blog at all. Anyway - with all that said, I am back today on this Sunday to share a card with you that I hope to bring a smile to your face. The person that received this card sure did like it, and it perked her spirits up and that was the whole intention!! With this card I used some Kraft card stock from PTI, and paper from the Sweet Nectar 6 X 6 pad from K & Company. 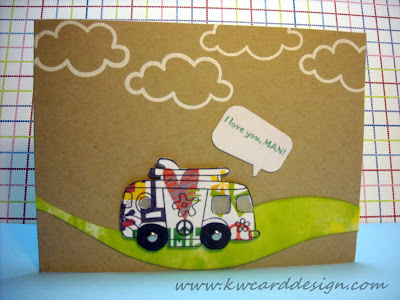 I used one of my favorite new background stamps from Hero Arts called Envelope Pattern. I inked it up with Colorbox Frost White pigment ink. I punched the edges of the patterned paper with one of my Fiskars border punches, and layered them on top of one another. Then I took some of the cute Puffies stickers from KI memories, and adhered them to my card. 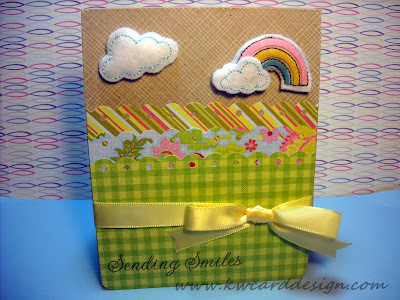 My sentiment comes from another Hero Arts stamps set called "Sending Smiles". I finished off by adding some ribbon from PTI. I hope to get back on track with more posts, so bare with me!!! Thanks for stopping in!! Hi!! After a few days of absence from blogging - I am back to share with you a card I made for the Flutter By Wednesday Challenge for this week. 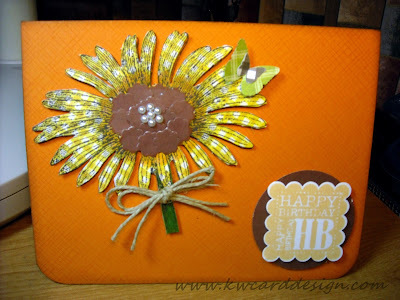 This time we have a beautiful picture to be inspired by with sunflowers, and beautiful bright colors. Here is what I came up with. I stamped the beautiful Engraved Daisy Cling stamp from Hero Arts onto some paper from Authentique, and then used my Fiskars craft knife to cut out the image that is so detailed. I added some color to the middle of the image by coloring with my YR12 Copic marker, and also punched out several flower design pieces using one of the "Itty Bitty punches" from SU!. I added some pearls and a hemp twine bow, and of course added my butterfly to the top edge of one of the petals. I thought this would be a beautiful birthday card - and so I stamped the "Happy Birthday" sentiment from the SU! stamp set " Punch Bunch". My card base is some card stock from Papertrey Ink - Terracotta Tile. I love their card stock!!! Till we meet back here again!! Thanks for stopping by! Happy 4th, America!! I am taking advantage today of my freedom by doing some crafting!! How I love being creative! 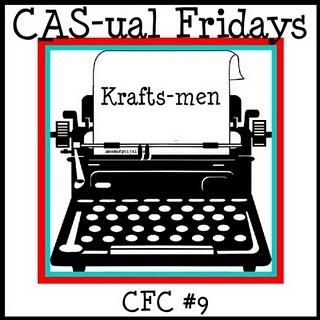 I wanted to share with you another card I am submitting for CAS-ual Friday Challenge. 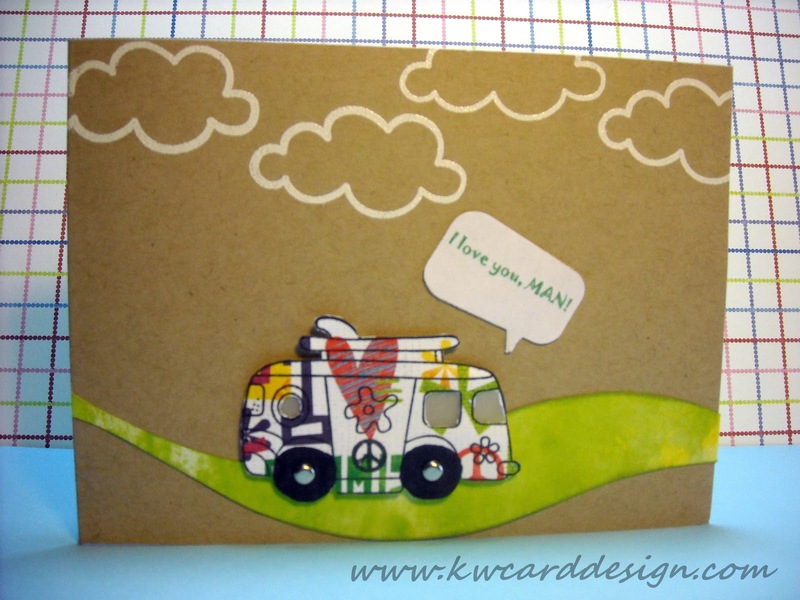 This is the first time I am submitting two cards - but I just had to as I had an awesome idea for a masculine card and putting it on yummy Kraft card stock!! Check it out dude ( and dude "ettes") teehee. I had bought this adorable bus stamp at Hobby Lobby in one of the sale bins - and I don't get to use it too often - in fact I think this is twice I have used it. It is adorable, and I was moving some of my stamps around this morning, and thought I should make another card with this cute thing, and away I went!! I stamped the image on some patterned paper from the Lauderdale 6x6 pad from Basic Grey. I cut out my image, and for the windows, I carefully cut the centers out, and added some vellum card stock for the "window" look. I added two brads to the wheels. I stamped some clouds, and heat embossed them with white embossing powder, and added some paper from that same stack for the "grass/hill". I popped up my bus with pop dots, and added my greeting, which I made typed up myself on my computer. Clean and simple - that's the name of the game!! 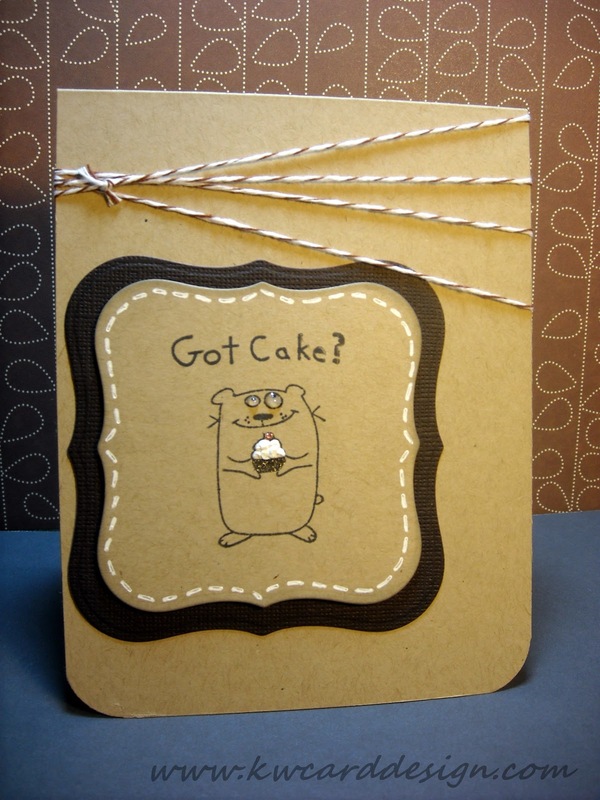 This card took very minimal supplies - Kraft card stock, black card stock, nestabilities die, baker's twine, white gel pen, liquid applique, and glossy accents. Not bad. I would take that cupcake from that cute lil guy anytime with those eyes lookin' at me like that. *snicker*. What ever your plans are for the 4th, be safe, and have fun!! !